Okay, so let’s be honest, these plants are not for the faint hearted, they are big, and we’re talking really big. Not in the Gunnera definition of the word, but big nonetheless and comparably prehistoric too! Not suitable for the small garden, they are however, extremely impressive when contained and nurtured properly, perfect for a waste piece of ground where nothing else will grow, even thick solid clay can’t contain their strong spreading rhizomatous roots. 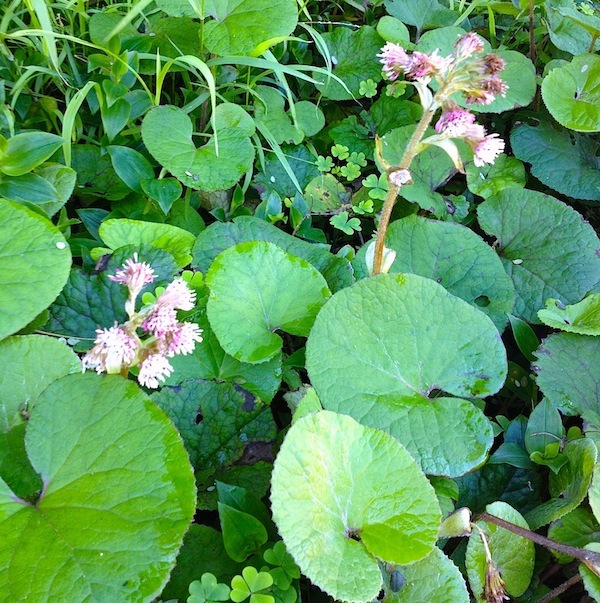 From the fairly innocuous P.fragrans which at 12” tall is the baby of the group, to P.jap.gigantea standing at 4ft tall with 2ft wide leaves, they deserve to be better known and grown. The four varieties we have growing at Lewis Cottage are all listed below. This imposing, spreading, landscaping perennial has leaves growing up to 5 feet tall and 4 feet wide and will form large colonies in time. The posy like flowers emerge in early spring before the foliage as creamy white rounded clusters at the ground and are popular with flower arrangers. Its a spreader though we find it fairly easy to control here since the rhizomes are just below the soil surface and easy to pull out where we don’t want it. 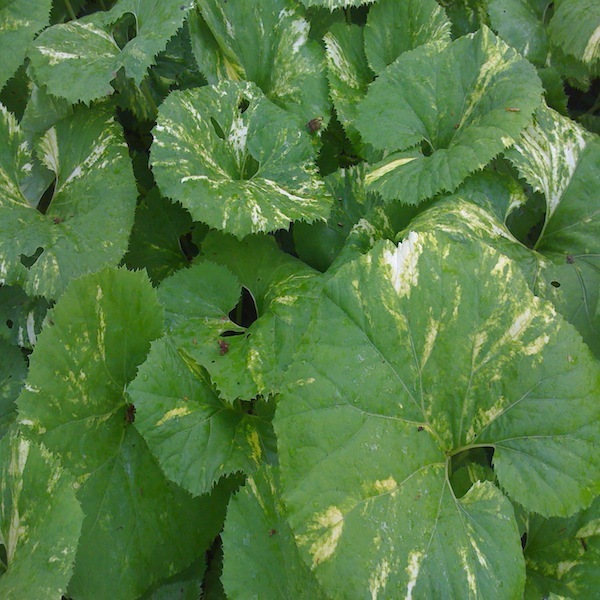 Petasites japonicus variegata is a very hardy plant with large round leaves. Each leaf grows from an underground rhizome. The leaves are larger usually 1 to 2 feet across and green with bright yellow markings. Plants bloom with white flowers early spring. 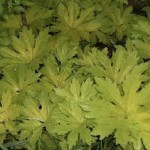 Preforms best in shade to partial shade with moist to boggy soil. It can handle more sun if soil remains wet. Very tropical and prehistoric looking plant. This plant, introduced from North Africa, has spread throughout Europe and forms large patches of heart or kidney shaped leaves.. It isn’t a very prolific flowerer and in spring, summer and autumn it only shows leaves. Strangely for a plant which flowers in mid winter it isn’t very frost tolerant so severe weather in late December will kill off much of the “crop”. P. fragrans smells of vanilla and flowers from November through to February, providing a valuable source of food for bees! 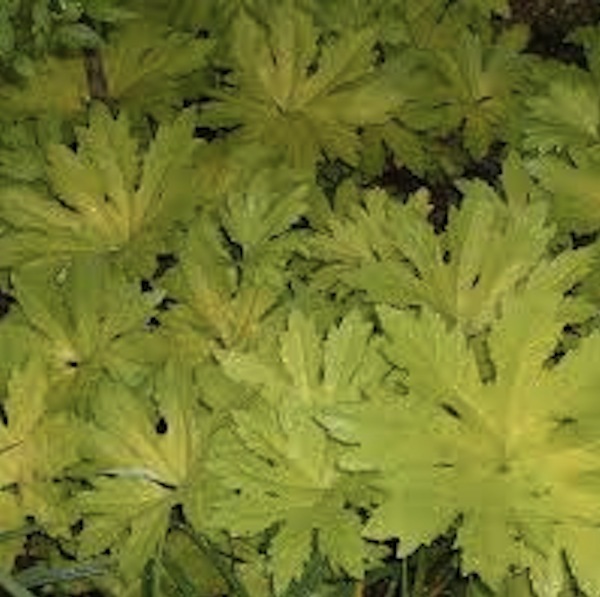 Less invasive than it fellow Petasites, “Golden Palms” jagged-edged, umbrella shaped leaves are a beautiful bright chartreuse yellow shade, perfect as a foliage accent in a moist to wet border. Bizarre pink drumstick flower spikes appear in very early spring. 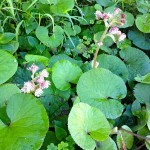 As with all Petasites, plants are inclined to spread underground to form a patch. Ideally needs afternoon shade in hot summer areas, though in cool climes full sun will produce the best chartreuse foliage colour.